Contains 6PT sizes: 7 X 8mm, 9 X 10mm, 11 X 12mm, 13 X 14mm and 12PT Sizes: 15 X 17mm. The sockets and attachments in this 20 piece 1/2" drive 12 point SAE deep set feature outstanding corrosion resistance as a result of our proprietary in-house plating process. Each socket is made from premium tool steel for maximum durability and has a distinct brilliant jewellery-like finish. The included high torque ratchet features a closed back which reduces potential ratchet mechanism damage from dirt and debris. Made in Canada and backed by Gray Tools worry-free lifetime warranty. 32mm Chrome Vanadium Steel 12-Point Metric FP Combination Wrench features durable chrome vanadium steel construction and includes a professional chrome finish that resists corrosion and wipes clean easily. The large size markings stamped on the wrench offer easy readability. The Husky 10-Piece Metric Combo Ratcheting Wrench Set has as 12-Point pattern design for off corner loading, to prevent fastener damage and to increase torque on rounded fasteners. The sleek head design fits into areas where most standard wrenches will not fit. The ratcheting box-end needs as little as 5-Degree to move. 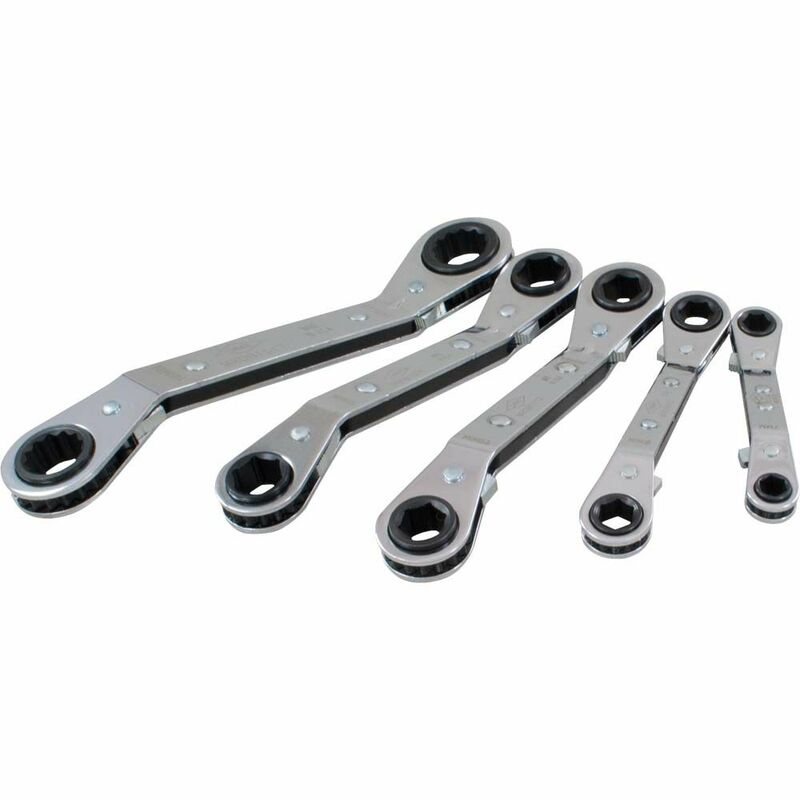 5 Piece 6 & 12 Point Metric, 25 Offset Ratcheting Box Wrench, 7mmx8mm - 15mmx17mm The ratcheting wrenches in this 5 piece feature a 25 degree offset which makes them ideal for use on hard to reach or restricted access fasteners. The chrome finish provides excellent protection against corrosion. Made in USA and backed by Gray Tools worry-free lifetime warranty.